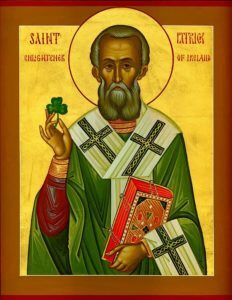 SAINT PATRICK – A MAN FOR OUR TIME! And Patrick loved his people, and prayed incessantly for them until the end. So, on this great feast of Saint Patrick, our patron saint, let us thank God for all his graces and blessings, let us renew ourselves in living out our baptismal promises, and to cherish with love the faith which Patrick so ardently preached and handed on to us. May our country once more become “The Island of Saints and Scholars.” May we be filled with the spirit and zeal of Saint Patrick and pray earnestly for our country which is in such need at this time.